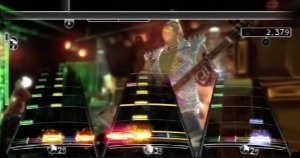 In a surprise move, Harmonix has announced its intention to issue a sequel to last year's smash hit videogame Rock Band. Rock Band 2 will be fully compatible with existing Rock Band controllers, but will also be bundled with upgraded versions of the game's instruments, according to IGN. More importantly, the new game will also make use of existing Rock Band downloadable content, so large collections of downloaded tunes won't suddenly become obsolete. The number of songs to be included with the game may reach as high as 300, but has not yet been confirmed. "As successful as the original Rock Band continues to be, we've now had the benefit of the last eight months to listen to our fans' requests and to build upon that foundation," said Alex Rigopoulos, CEO of Harmonix, the developer behind the game. "Rock Band 2 is a second-generation band game that will elevate the music game experience to the next level." Rock Band 2 is currently scheduled to ship for the Xbox 360 in September, while "other platforms" will see the game later in year. "Microsoft has been a great partner throughout the launch of Rock Band in the last year and their continued support is instrumental in supporting the more advances features and cross-title compatibility we will have in Rock Band 2," a Harmonix rep said. "Of course, our goal is to make Rock Band 2 accessible to all and we look forward to bringing Rock Band 2 to all relevant platforms later this year." In a follow-up interview, Rock Band Lead Designer Dan Teasdale confirmed that even after the release of Rock Band 2, downloadable content will continue to work with the original game. "We've been working hard with Microsoft and Sony to develop a way to share content between games, and we're really happy that we'll be the first game to support fully functional cross-title DLC," he said. "As far as Harmonix is concerned, there's no difference between Rock Band 1 DLC and Rock Band 2 DLC - we're just releasing awesome songs every week onto the Rock Band platform, all of which are playable by the Rock Band titles that support DLC." IGN's full interview with Dan Teasdale can be read here.